This program will be presented entirely in Spanish! Too often, ISO/IEC 20000 is perceived as a “prize” awarded to organizations with mature ITSM processes. The truth is that ISO/IEC 20000 describes the minimum critical activities that organizations should be executing to manage their services and ensure continual service improvement. This presentation will some focus on the practical aspects of ISO/IEC 20000 and how the standard can be used to support new or existing ITSM initiatives. Bill Cunningham, SIG Program Chair, will lead participants from Emory, Clemson, Georgia State, and Fresno State in a panel discussion exploring how today's economic realities have shaped ITIL/Service Management strategies in higher ed, both for better and for worse. A number of Configuration Management System (CMS) vendors, understanding the complexities of sharing data across product boundaries, have developed a specification to simplify sharing this data via federation. CA, along with other vendors, formed the Configuration Management Database Federation (CMDBf) Working Group. The CMDBf provides a vendor-neutral standard for federating CMDBs and other management data repositories. As the standard becomes more widely used, it will ease the task of federation with external sources and implementation of Service Asset and Configuration Management and CMS. With a recent update just approved and published by the DMTF, we invite you to join us and learn the value of standards-based CMDB federation and how you can reduce the cost and uncertainty of your IT deployments and foster better decisions to increase service availability and decrease resource consumption. Ram Melkote is the Product Manager for CA CMDB. He manages the product strategy for CA CMDB along with the product federations that underlie the Unified Service Model (USM). Ram has over 20 years of cross functional experience in the IT industry across service management, IT applications, SOA , BPM, Middleware, Databases, and Systems Management. Marv Waschke is a development VP and Senior Advisor in Product Management in the CA Chief Architect’s office. Marv began work with network and telecommunications management applications at a large aerospace company where he began work on the product that eventually became the CA Service Desk. He participated in the design and development of the CA CMDB. He represents CA on the CMDB Federation working group and was an author of the recently released DMTF CMDB federation standard. "Please join us for a presentation by Jack Probst, a leading ITSM expert and a follow-on Q&A session. Jack will discuss Service Portfolios and Service Catalogs in Higher Ed. Jack will also consider the criticality of communication with an eye toward setting clear expectations, communicating benefits, and driving awareness." Virtualization, like most technology innovations, has had its share of success stories and failures. This presentation asks the question “What is the difference between a success and failure in the virtualization?”. David Cannon will consider the standard answers given to this question and then explore what they mean in the context of Service Management. The answers will probably not be surprising, but the way they have been applied may be! 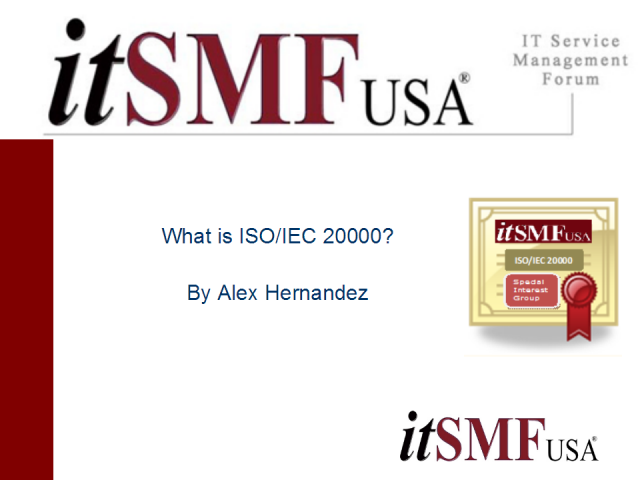 Title: What is ISO/IEC 20000?